In a world where the standard-bearer for the Republican Party just gave away classified information to the country that interfered with an election on his behalf, a day after he fired the person in charge of investigating that interference, it’s tempting to overrate any Republican who can string two sentences together. 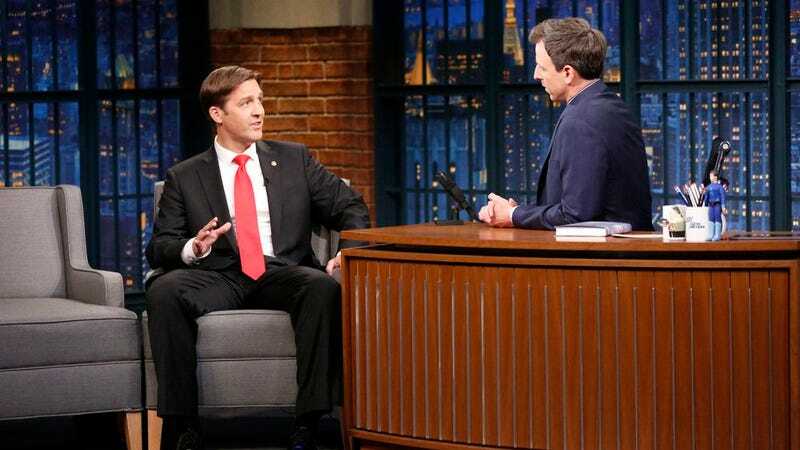 And Nebraska Senator Ben Sasse, with his wholesome demeanor and willingness to appear alongside noted Trump-pummeler Seth Meyers, certainly came off like a decent enough guy last night on Late Night. Sure, Sasse was there to promote his book extolling, essentially, the need for these darn millennials today to toughen up (preferably by delivering baby cows, as he sent his own 14-year-old daughter to do last summer). But, as an early and vocal critic of Donald Trump’s candidacy, he and Meyers at least had some common ground for what turned out to be a civil conversation about the state of the country. Sasse also deserves credit for not fleeing this previously scheduled book tour stop once the news of Trump’s most recent reckless buffoonery broke, shortly before taping. Still, the guy’s smoothness made his protestation of being taken aback ring hollow, since he’d already whipped up a carefully worded list of three talking points about Trump’s latest treason gaffe, and segued into easily digestible clichés about “restoring trust in our institutions,” and the like. Meyers pressed Sasse on the fact that he’s voted to confirm all but one of Trump’s nominees after, among other things, accusing candidate Trump of thinking “he’s running for King.” And that a lot of American kids need more help from the government (or even character-building dude ranches) than do Sasse’s own, well-off children. (Sasse’s repeated “That’s a good point” might almost pass for an admission of hypocrisy.) Still, as Meyers put it—sounding grateful that, even though he and Sasse disagree about a lot of things (for example, Planned Parenthood scores the conservative Sasse at 9 per cent on women’s issues, while the League of Conservation Voters him a big fat zero)— he respects that a member of the Republican Party can articulate coherent positions he actually stands behind. Which is the where the bar is set at this point.